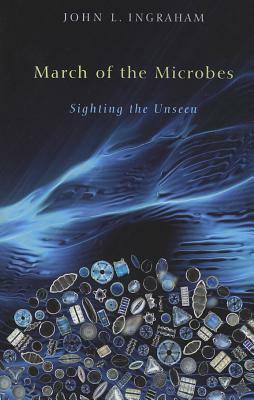 March of the Microbes: Sighting the Unseen 4.5 StarsThis is a nicely written, fascinatingly informative book about microbe watching and how microbes function to produce the effects we see. Includes such things as the methane gas in smelly ponds, why ocean fish smell when they go bad, the production of wine, why yeast is included in bread, colourful microbe effects, various symbiotic relations, carbon/nitrogen/sulphur cycles, extremophiles, salt manufacture, ergotism, mushroom rings, and all sorts of other bacteria, fungi and viruses.NOTE: Minus a 1/2 star for not including the biochemical/ chemical formulae, for no colour/ B&W photographs of these fascinating microbes and for not including references. If you are a biological entity you should read this book.When I saw the Discovery/BBC productions of "Planet Earth" and "Life" I thought, this is ridiculous, a series focusing on the life of Earth and no featuring ANY microbes? That's like doing a documentary on American film and not mentioning Hollywood. Ingraham makes similar remarks about national parks that display a history of life on Earth without mention of bacteria, or signs that proclaim that plants are the only organisms that get energy from the Sun. In fact plants don't actually do this, but have enslaved a bacteria (that we call a chloroplast) to do it for them; an 'enslaved' bacteria in my cells is similarly responsible for my ability to type this sentence. Thankfully there is this book, which if I had a class to teach, would be one of the texts. The book covers all microbes: bacteria, archaea, fungi, and protists, as well as the lifeless viruses and prions. Not surprisingly the bulk covers bacteria.The book is split into sections covering themes of 'microbial encounters', explaining how microbes influence the planet and its inhabitants, from the food and beverages we consume, to the production of snow at ski resorts. Sections on metabolism describe the overall import of microbes in cycling things like sulfur, carbon, and nitrogen, and how if they weren't here to do it, no other life would be. Thankfully, Ingraham does this without getting overly bogged down in the details of metabolic biochemistry.Even for a seasoned microbiologist, the book provided new information, for example that the xanthum gum that is present in a great many of the foods we eat is nothing more than the dried corpses and secretions of a bacteria.Anyone curious about the world, food, technology, or health should read this book and you may very well be surprised of the myriad ways microbes are present in your life, the enormous impact they make on your existence, and why understanding them is important to our health and civilization. Excellent read. Not too technical with a good glossary. Writer convinced me that this is their world and we just happen to share it with them. I learned a lot. Viena no labākajām grāmatām par mikrobiem ko esmu lasījis. Daudz faktu, piemēru no dabas. Vietām kļūst nedaudz tehniska un ieslīgst bioķīmisko reakciju niansēs, bet tas ir pavisam nedaudz. I enjoyed the read, although I did skip over parts. This was really just a collection of essays on different microbes, loosely grouped by some aspect of their metabolism. I prefer learning about general principles, a compression of many different phenomena, rather than just a list of facts. However, I was intrigued by a few facts; - Taq, the type of polymerase used in polymerase chain reaction was derived from an extremophile, specifically one that can live in high temperatures, thus it needed to develop a polymerase that could work a high temperatures.- Microbes can actually aid the coalescence and nucleation of water. Thus a forest and induce rainfall. See InaX. I am especially interested how this evolved.- Cows don't live off grass, they live of the bacteria that feed on the grass in their rumen which they digest later.- ? A few others I will get back to laterAfter reading this I am doubtful of how many microbes I will be able to identify in the wild. Fascinating look at the smallest form of life that collectively outweighs us all: microbes.This book works as both a primer on the smallest lifeforms on earth and as a wonderful travelogue, visiting the places where they make their homes and how they affect everything on the planet. After a couple of introductory chapters giving us a general overview of microorganisms and how they function, the author moves along to their contributions to the foods and drinks we consume, how they contribute to the nitrogen, sulfur, and carbon cycles, and how they survive extreme cold and heat. After that are chapters on fungi, viruses, and bacteria.Every chapter is full of information you wouldn't suspect has anything to do with microbes: why Swiss cheese is full of holes, the difference between regular and sparkling wine, why aphids are important to ants, why cows (and people) release methane, why there are so many colors in the heated waters in Yosemite, why not all bacteria are bad for you, and much much more. Having recently taken a chemistry class this book really brought together a lot of the information I learned in the abstract and made it more concrete with examples from real life situations. A must read for anyone interested in the subject, and especially for anyone taking life science classes. Very Informative and covers a vast majority of topics. Was an interesting and definitely educational read, but this isn't for nonbiology/chemistry inclined readers. The book is only 306 pages, but it is very dense and packed with lots of information. I had to pause every once in a while to sit down and think about what I read and fully absorb the information. I really like that charts and diagrams were added in the book so the reader could see the big picture. It's a great informative read regardless and I do recommend this book to anyone who is interested in microbiology or taking the class at some point. Give yourself plenty of time to read if you really want to understand and remember a good amount of the information in the book. Genuinely the best book I've read in a while. Have annoyed at least a dozen people with my banging on about it. But I can't help it! Ingraham is clearly loads smarter than I could ever hope to be, but he doesn't write over the reader's head. Instead, he elucidates complex science in a straightforward, conversational manner — and he's truly funny, to boot. Cannot count the number of times I actually laughed aloud (or uttered, "SHUT UP!") whilst reading on the tube, thereby breaking the London Commuters Social Contract. Would also like to note that the grammar/syntax/style of March of the Microbes is flawless, making for smooth reading. Give the responsible editor a raise. On all counts, I unreservedly recommend this book to anyone who likes science, reading and/or pleasure in life. This is a wonderful book surveying the microbial realms and our knowledge of it. I found it a bit basic, but that I think that is actually a strength, given that it is aimed at a general audience, and not a professional. It was quite fun, too. The science is presented very well, and very accessibly. I was rather surprised at how much information was conveyed in such a graceful way that the author could build upon it without being likely to overwhelm a layperson. It is quite an accomplishment, that. I could see this book being used as perhaps a high school microbiology text, and the kids actually reading it. A great overview of the huge part that microbes play in our lives. I want to learn about more microbe sightings! While I was reading this book, I kept envisioning this as an AWESOME documentary series. I guess that's the mark of a good nonfiction. I would say the book is great at explaining basic microbiology concepts, and was a good refresher for me (having taken bio in highschool and microbiology in college) - but would probably seem rudimentary to my doctor, biologist, and biotech friends. My only major complaint with the book is the editing - too many of the big words were cut between lines, making them tough to decipher. I really liked it though! This book started off strong, but in the middle there are several chapters on various natural cycles (sulfur cycle, carbon cycle, nitrogen cycle) that are incredibly boring. In these chapters, it reads like a textbook and I would know because I've read that textbook already and found it boring then. I found it to have lots of fun microbe facts, some I knew about and others I didn't. The last few chapters were again interesting. I like the idea of writing as if you were on a microbe hunt, searching to find evidence of these invisible creatures. Overall a bit stuffy, but the random tidbits here and there were amusing enough to keep me reading. A fabulous book about, what else, microbes! Most of the science in it is lay friendly. Fascinating facts about things we literally couldn't live without - both as individuals, and from a global perspective.As an example, I always thought cows got their energy from grass - but they don't. Their gut microbes get the grass energy and secret organic acids as by products that are nutrients the cow can absorb, plus the cow digests all the dead microbes which supplies the needed protein. Although we rarely think much about them, microbes make their presence felt in myriad ways. This book looks at the effect microbes have on our world by drawing our attention to what the author calls "microbe sightings". Come along on this hunt to find microbes exerting their influence. This book has a solid scientific basis without being overly technical. A very accessible, fun, and informative look at the microbes all around us. This is written rather as a guide, pointing out the readily seen/smelled/tasted evidence of microbes at work in (mostly) everyday situations. I enjoyed learning MANY new things, including how cows get their protein, and why I have ALWAYS said that beets taste like dirt. written for the layman, this book is my advanced microbiology class, but fun. proton pumps, woese, archea, it's all there. the cycle chapters were a bit boring but thorough. also he tells a lot of interesting facts i didn't know--for one, how cherry cordials are made. read this if you're a science buff, definitely!! microbes are everywhere and we couldn't live without them. This book tells you why in a very readable and fun style. Excellent look into the life of bacteria, archea, and viruses for the non-scientist. One of the best 'microbe' books I have ever read. If you only want to read one book about bacteria, make it this one. The roles that microbes play in our world is amazing.